One of the best discoveries of my bird watching career is the binocular harness. Year after year went by birding with a stiff, sore neck from using the standard neck strap that comes with most binoculars. So if there is any birdwatching accessory out there for you to splurge on, it would be a harness. They remove the strain off your neck by distributing the weight of the binoculars through your shoulders. I honestly could not believe how much lighter the binoculars felt after using the harness versus the neck strap. 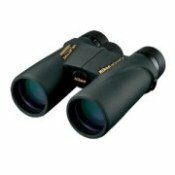 There are primarily two different types of attachments for securing your binoculars to the harness. 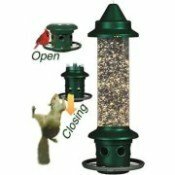 One is a quick-release, buckle-type attachment and the other is a snap-on type of release. 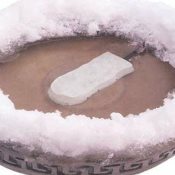 I would say that definitely the quick-release is quicker (hence the name!) then the snap-on type. 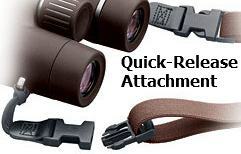 The quick release buckle also attaches to the binoculars differently than the snap-on, which some people like. 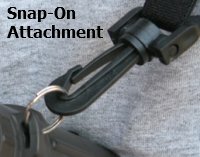 For the snap-on attachment, you usually have to attach metal rings (usually included with the harness) to the neck strap anchors of your binoculars because they are typically not wide enough for the snap-on attachments. Some don't like the metal rings because they will sometimes rub against the binocular finish, but I personally have not found this to be the case. On the other hand, the quick-release attachments can be attached to the binocular strap anchors because you are sliding a strap through them first and then the quick release buckle, located further up the strap, is attached to the rest of the harness. How Much Should I Pay for a Binocular Harness? Like most birding accessories, there are cheap binocular harnesses you can buy for around $10 and there are expensive harnesses for over $30. Some people like to get a harness that is the same brand of their binoculars. So if you get a pair of Swarovski binoculars, you get a Swarovski binocular harness (hint: guess which harnesses are over $30?). So what is the difference between a $10 harness and a $30 harness? Well every harness has its basic parts. They include elastic straps, a patch for the straps to slide through and center on your back (some harnesses have bigger center patches with mesh for better airflow, others just have simple leather patches) a couple of adjustment clips and release snaps that attach to your binoculars. A binocular harness is not a high-tech, complicated piece of equipment so there is only so much upgrades a company can put into them. I do think it is possible to go too cheap where you have cheap plastic or elastic that may wear down quickly. I would say you would get enough quality in the harness if you stay at least in the $15-$25 range. If you really want to go all out and get real fancy, you can get a Binocular Harness with Pouch which your binoculars sit inside of instead of just being out in the open. This helps keep dust out and is weatherproof in case it starts raining or snowing. 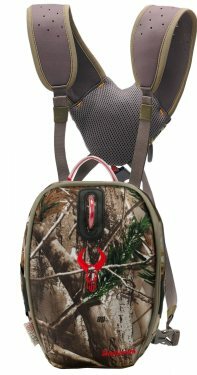 This one has a magnetic closure for easy access, built-in hydration bladder, comfortable padded straps and Badlands lifetime warranty: "We will fix it free forever." I would say this kind of setup is especially good for those who would be riding ATVs or horses or walking off-trail in heavy brush where the dust issue would be more of a problem. Whatever type of binocular harness strap you decide on, you most likely will not be disappointed especially if you have been using a neck strap. What is nice about getting a binocular harness is that they can be used for holding other things other than binoculars such as cameras.